COLUMBUS, IN--(Marketwired - March 18, 2015) - Cummins Emission Solutions, a subsidiary of Cummins Inc. (NYSE: CMI) and a technology leader in the global exhaust aftertreatment market, is introducing the first of its next generation of ultra-high efficiency aftertreatment systems, the EcoFit Single Module. The EcoFit Single Module is designed to be up to 60 percent smaller and 40 percent lighter compared to the EPA 2013 solution it supersedes, all while improving emissions reduction performance. 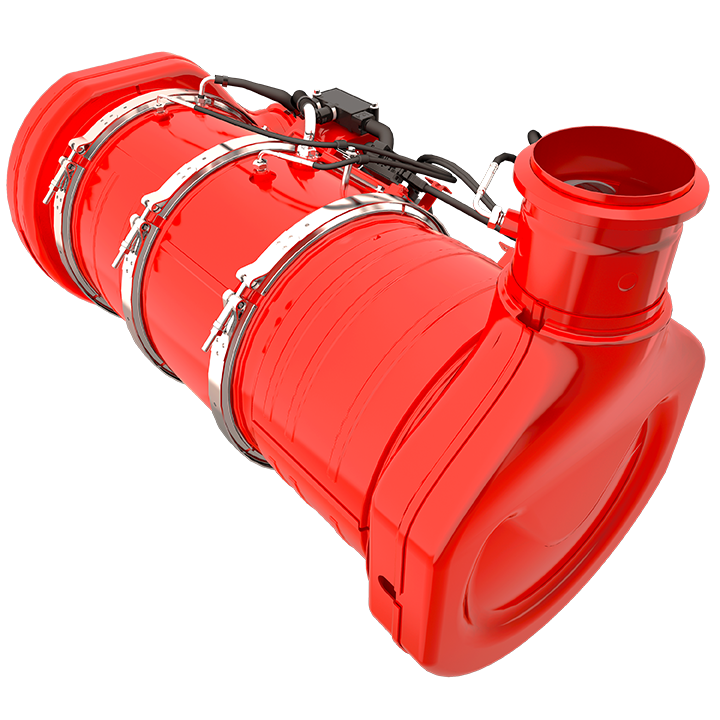 The smaller size enables better heat management and retention for improved fuel economy capability, while the simple single-pass exhaust flow design delivers low back pressure, meeting the needs of end-user customers. The simpler, innovative packaging allows for fewer variations, offering OEM customers system integration benefits, while providing end-user customers with a more robust and reliable aftertreatment system. This new solution, which will meet GHG and fuel efficiency standards for EPA 2017, specifically addresses the needs of medium- and heavy-duty engine customers in low emissions markets. "We are very proud to announce this groundbreaking platform and believe it is a game changer in the commercial vehicle aftertreatment market," said John Carroll, General Manager - Global On-Highway Business. "This product uses innovations in catalyst and urea dosing technologies unique to Cummins Emissions Solutions to deliver an ideal solution in the market." "We've achieved incredible results with this product through an entirely new engineering approach to aftertreatment systems," Carroll continued. "Historically, aftertreatment systems have been designed to meet emissions requirements; however, we've approached the development of this system to meet our customer needs first, while also meeting emissions standards and maintaining product integrity. We designed a product that will not only meet, but also exceed customer expectations." Advancements in catalyst technologies have allowed the diesel particulate filter to have a bigger ash capacity, permitting for increased time between maintenance events and minimal operator intervention. Improvements in NOx reduction capabilities in the selective catalytic reduction system have been enabled by the use of the EcoFit UL2 Liquid-Only Urea Dosing System. OEM customers will benefit from simpler chassis integration, as the UL2 system does not require engine coolant lines to and from the diesel exhaust fluid (DEF) injector. Operators will see more efficient atomization of urea and minimized urea deposits, thus requiring fewer regeneration events while experiencing the optimal use of DEF throughout the system. This product allows Cummins Emission Solutions customers to operate the optimal engine and aftertreatment system with minimal impact to their operations. This product is set to makes its debut at the Mid America Trucking Show in Louisville, Kentucky on March 26th. Cummins Emission Solutions, a subsidiary of Cummins Inc. and a business in the Components segment, is a global leader in designing, manufacturing and integrating exhaust aftertreatment technology and solutions for the commercial on and off highway light duty, medium duty, heavy duty and high horsepower engine markets. Dedicated to innovation and dependability in meeting global emission regulations, Cummins Emission Solutions develops and produces various emission solutions. These solutions include custom engineering systems and integrated controls, oxidation catalysts, particulate filters, NOx reduction systems such as selective catalytic reduction and NOx adsorbers, and engineered components. With key operations in the US, China, India, United Kingdom, Germany, Brazil and South Africa, Cummins Emission Solutions serves both OEM and engine first fit and retrofit customers. Cummins Inc., a global power leader, is a corporation of complementary business units that design, manufacture, distribute and service diesel and natural gas engines and related technologies, including fuel systems, controls, air handling, filtration, emission solutions and electrical power generation systems. Headquartered in Columbus, Indiana, (USA) Cummins currently employs approximately 54,600 people worldwide and serves customers in approximately 190 countries and territories through a network of approximately 600 company-owned and independent distributor locations and approximately 7,200 dealer locations. Cummins earned $1.65 billion on sales of $19.2 billion in 2014. Press releases can be found on the Web at www.cummins.com. Follow Cummins on Twitter at www.twittter.com/cummins and on YouTube at www.youtube.com/cumminsinc. About this company Cummins Inc.